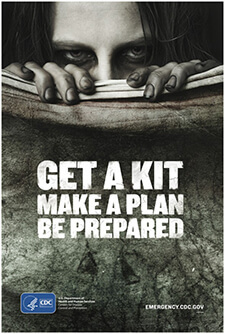 You never know when disaster might strike; it is always better to be prepared for the worst. The 8 letters of the word ‘SURVIVAL’ form the starting letters of the 8 basic actions for survival; this is a handy method of remembering them. Keep in mind that these factors for survival can be used for any catastrophic disaster. They can be found in the FM 21-76, Department of the Army Field Manual and is used for ANY disaster. We have incorporated its importance for the zombie apocalypse. Understand exactly what the danger is and identify the safe zones, where you can hide from the enemy or the source of danger. Employ all senses – audio, visual, olfactory and tactical – to assess the situation. Keep track of the enemy at all times and try to guess his next move; is he planning to stay put, advance towards you or retreat away? The developments on the battlefield should be central to your survival plan. This includes your surroundings, your physical condition and your equipment. Determine the rhythm of your surroundings, be it a desert, jungle or any other area. This includes the sounds and movements of animals and birds as well as humans, especially the enemy. Irrespective of the battlefield’s pressure, check your body for wounds or other signs of trauma. Get the required first aid and avoid getting further physical injury. Lots of water is always recommended to keep the body hydrated. Wear additional clothing in wet or cold conditions, or else you might suffer from hypothermia. Check if your equipment has disappeared while you were engaged in battle. If it is still around, assess the extent of damage and its usefulness going ahead. After sizing up your situation, you must make your survival plan. Of primary importance are your 3 basic needs i.e., water, food and shelter, in that order of priority. But the planning must be done with a relaxed mind. Take time before you act, lest silly mistakes lead to your capture, or even death. Haste often causes confusion, forgetfulness and carelessness. Keep your powers of observation sharp; if the enemy is nearby, you must be prepared to move away safely at short notice. Get your bearings and plot them on a map. The map, along with a compass, is an essential item that you or someone in your group, vehicle or aircraft must always have on their person. Moreover, it is important that you know who that designated person is, so that you can retrieve the map and compass from their body in case they are attacked and killed. When on the move, observe the direction in which you are headed and do not assume that some other member of the group will keep track. Orient yourself with respect to the location of enemy units and controlled areas, of friendly units and controlled areas and of local water sources, for the very least. The latter is crucial when you are in a desert. Be aware of which areas will allow you to hide yourself from the enemy. Using all this data, you are then equipped to make intelligent decisions for your survival. Fear and panic are the biggest threats for you to survive in combat and evade capture by the enemy. You need to take control of these emotions and not allow your mind’s imagination to run wild. If not, you will exhaust your much-needed energy reserves and these in turn will bring in negative feelings, thereby hampering the process of intelligent decision-making. To defeat fear and panic, you must have self-confidence, which will automatically come with sufficient survival and evasion training. A survival kit is only useful as long as it and its contents last. Eventually, they will wear or run out and you will need to make the most of other things that you find around you. Improvising is a product of creativity. As residents of the United States, creativity is stifled because items and their replacements are readily available, at a low cost. You need to practice improvisation skills with tools used on a daily basis and preferably found in nature. Find new uses for that tool, as far as possible from its specific and obvious purpose. Your improvising powers will replace your survival kit when it is most required. In ancient times, mankind had to fight for a living. Though modern-day comforts exist, life should not be easy all the time as that would destroy your innate fighting spirit. 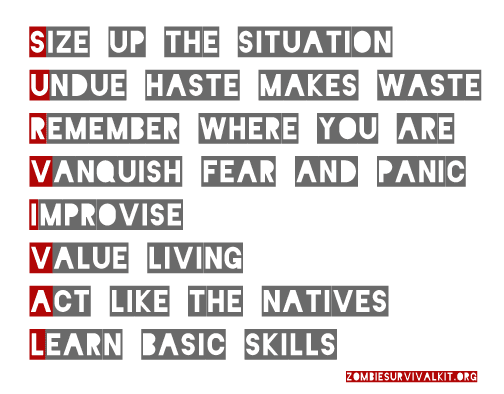 You must learn to turn any small uncomfortable or inconvenient situation into an opportunity to hone your survival actions, in readiness for stressful times. When you start taking life for granted, you start losing the will to live. You need to take up a tough stance when problems rear their ugly head and decide to fight them with all your might. 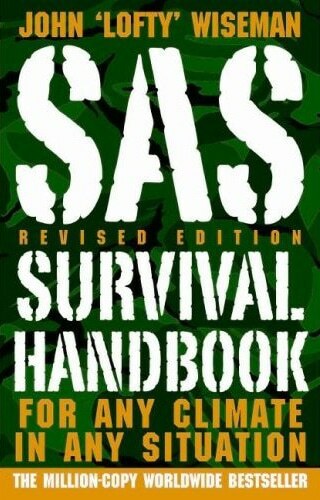 This physical and mental exercise is the key to your survival ability. Wild animals are fantastic survivors, since they have learnt the ways of the jungle and have used this information to satisfy their basic needs of food, water and shelter as well as to avoid getting attacked and killed by predators. Since your basic needs are the same, you can pick up survival techniques from the animals in your area. While doing so, you must remember to be subtle. There is a strong possibility of these animals reacting to your presence, which could alert the enemy to your whereabouts. The native people of a region know their environment in and out and have developed their daily routine around it. You can use the same sources of water and food as these natives, as well as follow their well-established routine. If you sense that they will not be hostile to strangers, you can strike a good bond with them by asking them for help to get food and water. They are often proud of their tools and will open up if you ask about them. You will gain their respect and friendship, besides fulfilling your main objective, which is enhancing your survival prospects. Being familiar with the points above is not enough for survival action. You need to back them up with proper training in basic survival and evasion skills on a battlefield. Do not wait until the eleventh hour, start as soon as possible. The training covers equipping oneself adequately and being aware of the environment, prior to battle deployment. You then need to practice the basic skills that you have been taught, so that they become second nature. In particular, get accustomed to those skills that would be more appropriate to your environment. If you are being sent to a desert, you must know the process of obtaining water. Make the most of training programs and exercises to get this much-needed practice while you can, so that all your fears are replaced by self-confidence and presence of mind. This completes the 8-step guide to survival. 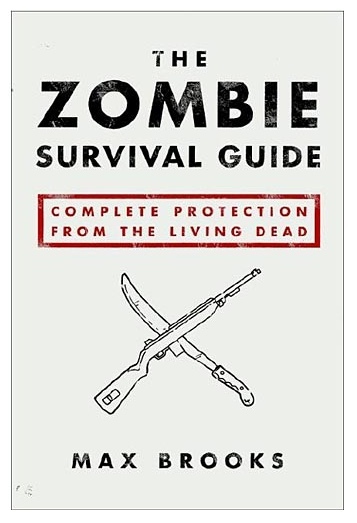 In summary, survival is a part of your nature, but like any other skill, it needs to be regularly practiced and improved upon, so that you are prepared for the zombie apocalypse or any major disaster. You survival pattern must be as follows; listed in decreasing order of importance: food, water, shelter, fire, first aid and finally, signals. The only exception to this order is in case you have an injury, in which case first aid takes top priority. In a changing environment, your pattern must also change according to your immediate physical needs. Ultimately, it is the survival of the fittest.